The 41510 Brand Has GOUN GREEN. The Travlyrics Co LLC ) has "GOUN Green" in cooperation with the Atlanta, GA based non-profit organization "Green Opportunities for Urban Neighborhoods (GOUN)". The two have agreed to collaborate and offer co-branded consumer products that are both fashionable and help promote a healthier evironment. This project is entitled "The 41510 Brand™ Green Collection". All items exclusively available via www.41510.com and inside the Travlyrics' Flagship Cafe: Travlyrics-On-Demand (aka T-on-D) powered by Travlyrics Custom Graphic Design and CafePress.com, the pioneer of on-demand screen-printed products. With every purchase, The Travlyrics Co LLC will donate a share of the profit to GOUN. 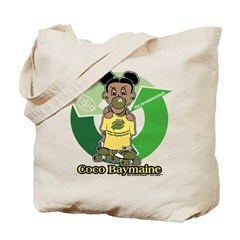 Items are embellished with custom artwork featuring "Coco (Green) Baymaine™" the trademark logo of The 41510 Brand Girl Stuff™ and artwork of GOUN's "Re-Movement" campaign. Products include: Organic Tshirts for her and him, Canvas Totes to help reduce usage of paper and plastic bags, even a Wall Clock. Kinchasa Taylor, Executive Director and Founder of GOUN Green, is a Bay Area Native with a passion for keeping the environment clean and healthy. She knew The 41510 Brand is a classic underground company of the Bay Area who was looking to grow more branches. Shortly after contacting the The 41510 Brand, a strategic relationship was formed, items created, and the deal was complete. "Since 1998, our uniqueness has been in our custom graphic designs." says Trav Lyrics, Founder of The 41510 Brand® Products, "It's a perfect fit, as we were looking for a sensible avenues to become more involved with community." The 41510 Brand™ was created to 'Identify Home™' for Bay Area Natives away from Home. Now, having GOUN Green, they support the environment and Green Opportunities for Urban Neighborhoods . The 41510 Brand, founded in 1998 by Trav lyrics. The phrase "41510" is a combination of major telephone area codes of the San Francisco Bay Area at the time. 415=WestBay (San Francisco, Palo Alto, Marin). 510=EastBay (Richmond, Oakland, Berkeley) . 41510 = Entire Bay Area under one brand. The goal was to create logo-driven shirts, caps and tracksuits for rap artists and frequent travelers from the Bay Area to identify Home while touring. Again, The 41510 Brand is to the Bay Area what the Yankees’ “NY” Brand is to New York.